This kitchen by designer Kirsty Davis has a pared-back simplicity, a look made easier with a large walk-in pantry directly behind. 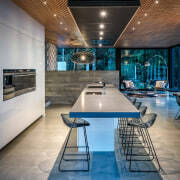 A kitchen design often references elements beyond its own footprint, complementing or enhancing the wider interior design or even the home’s architecture or its views. This project, by designer Kirsty Davis, is a pared-back example. 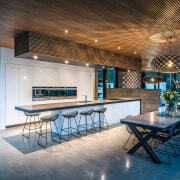 “The kitchen forms part of a concrete, tilt-slab modern home with soaring 3m-high ceilings, an open layout, lots of windows and polished concrete floors. 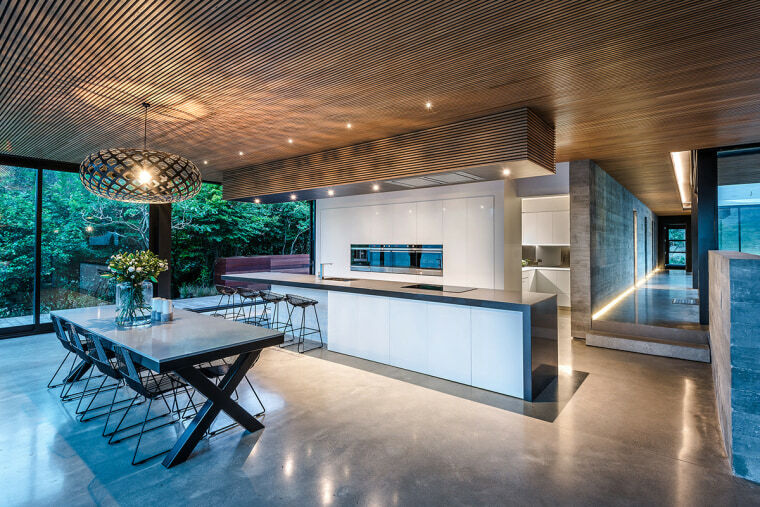 “In keeping with this look, the kitchen itself is sleek and contemporary – while at the same time creating its own statement,” says Davis. In reality, the long, floating bench is underpinned by a steel supporting structure. Another feature of the home is a rich Rimu batten ceiling with black negative detailing. Working with this, Davis designed a matching drop-down bulkhead to seamlessly house the cassette rangehood and ducted ventilation system. Offering a modern, minimalist backdrop, the rear of the kitchen is a wall of white vinyl, punctuated by a line of reflective ovens. 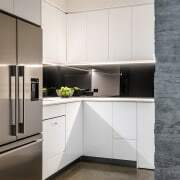 Storage and smaller appliances are fully integrated here.The large fridge-freezer, wine fridge and the dishwasher are all located in the open, walk-in pantry, accessed from the side of the kitchen. 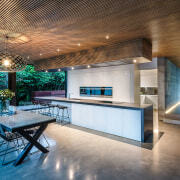 Black painted glass splashbacks in the pantry were set at the same height as the wall-mounted appliances in the kitchen. And the pantry is also in the same colours and materials as the kitchen, making it appear as a continuation of the more social space. Caesarstone Raven engineered stone by Shane Boyd Granite Benchtops; and Spring Snow Quartz by Marbello.